Everyone knows me as the wine guy. After all the blog says Maurice’s Wine Cru. Naturally you would expect me to blog about wine. However, in my job I oversee the beverage programs for the Cohn Restaurant Group. Spirits and beers are part of my daily routine. Although I spend a lot of time chatting about wine, I spend the majority of my day working with spirits. In fact today & tomorrow I am going to our newest restaurant OB Warehouse and training the new staff on the history of beer and spirits. Before I really got into wine, I was bartending. I was working in a Nuevo Latino restaurant in San Francisco, back when it was really “Nuevo”, and making Latin cocktails. This was just prior to the Mojito craze. Tequila has always been my spirit of choice, thus working there was very rewarding. I soon left and began my journey into wine, but never once forgetting about my favorite spirit, Tequila. Fast forward a decade and a half; when Sea180 opened in Imperial Beach, we knew that a lot of our guests were of a Latin American descent and many lived 5 minutes away, south of the border. The GM, Sheehan McCoy, created a bar menu with a Latin flair complimenting the “Baja Med” cuisine. Infused rum and tequila soon became a big part of the cocktail program. Sheehan was very creative in his infusions and created Infusion Thursdays where he offered discounts on infused cocktails such as banana brulee rum. These cocktails are derived from the classic Latin cocktails such as the Margarita, the Mojito and Daiquiri. Behind each cocktail comes years and years of evolution. The history of spirits is a murky one as distillation occurred in several parts of the world about the same time. However, spirits such as Tequila, Pisco, Rum and Cachaca are deeply ingrained in the history and culture of the Latin American nations of the Caribbean, Central and South America. The Mojito took America by storm in the 1990’s-2000’s. Little do people know is that is was first created by sailors to cure dysentery. The Margarita has a slew of stories around its creation. Who knows which is true, but it’s fun to hear them all. The Caipirinha is a Brazilian cocktail that made a comeback in recent years. Cachaca is a Brazilian rum which we see little of in the States, however, Margarita lovers I have a new drink for you. The battle over the best Pisco Sour is still being debated between the Chileans and Peruvians. Both use grape spirit for this classic cocktail and the variations are ever so slight. Maybe Chile makes better Pisco, but the Peruvians make a better Pisco Sour. And Finally, we will talk about the Daiquiri. This cocktail has probably evolved the most. We will learn about the different styles and how Ernest Hemingway changed the cocktail forever. 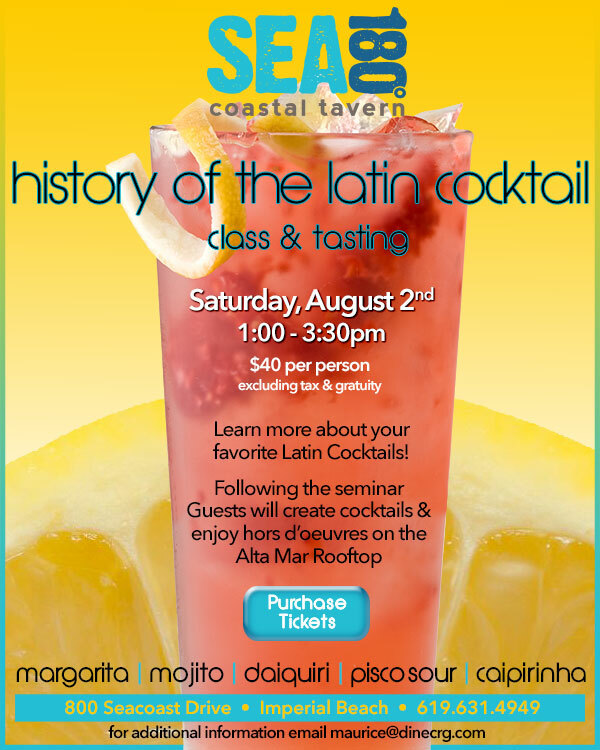 On August 2nd, Sea 180 Coastal Tavern will be holding an event in which we will teach the history of these Latin cocktails and spirits. After the 30-45 min class, guests will head to the roof top deck and get to take part in creating their own Margarita, Pisco Sour or preferred Latin cocktail. Hors d’oeuvre will be provided by Chef Ken Irvine from the Sea 180 Coastal Tavern kitchen.